From September 1st through 27th, 2017, Taipei-based IT research institute MIC (Market Intelligence & Consulting Institute), a trusted think-tank of the government in Taiwan, will hold a series of events – including two main panels - to celebrate its annual technology forum, known as MIC Forum, for the 30th round in Taipei and Hsinchu, Taiwan. This research showcase event will focus on how IT innovations and developments can help unlock the opportunities of new applications and business models concerning big data analytics, artificial intelligence, mobility, and cloud computing. A series of events will last the whole month of September, bringing opinion leaders, industry leaders, and prospective enterprise customers together, and covering technology areas that are critical for the future development of the IT industry, including semiconductor, artificial intelligence, mobile communications, networking communications. 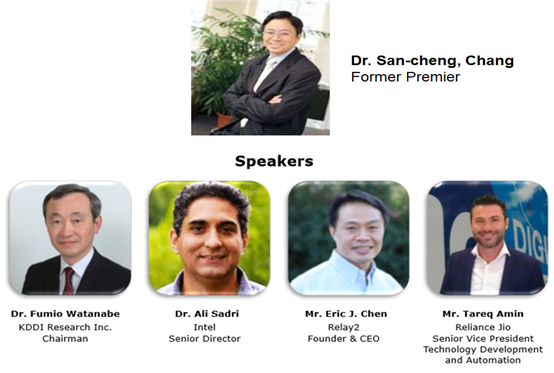 The agenda will include presentations by Chang San-cheng, Taiwan's former Premier, Teresa Lin, HR Executive of Human Resources of IBM, industry experts, university professors, and principle analysts of MIC, as well as two main panels, to be hosted by Victor Tsan, General Director of MIC. All sessions will be presented in Mandarin only except the Hsinchu session on September 11, which will be presented in English. In addition, MIC is also one of major sponsors of a two-day 2017 Taipei 5G Summit organized by Taipei 5G Technology Program Office of MoEA. The Summit will be hosted from September 12-13, 2017, at Banquet Hall, 3F, Taipei International Convention Center. World leading telecom operators, such as KDDI, T-Mobile and Vodafone, plus IoT experts, major equipment suppliers and leading chipset manufacturers will be present at this annual global 5G event. All 5G sessions will be presented in English. Founded in 1987, Market Intelligence & Consulting Institute, previously known as the Market Intelligence Center, is a division of the Institute for Information Industry and a leader in Taiwan's ICT industry research and consultancy. MIC is dedicated to providing a broad range of research on global ICT industry, covering supply chain analyses, market trends, emerging technology and major players' strategies, as well as Taiwanese IT industry development. With a research network spanning across Asia, MIC is ideally positioned to provide the intelligence, insight, and unique perspective necessary for our clients to make informed decisions.